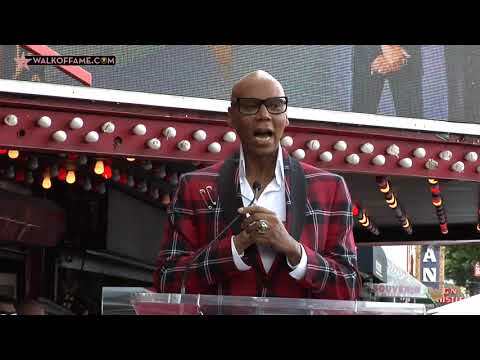 Watch the star ceremony as the Hollywood Chamber unveils the star for RuPaul below. “RuPaul is a Ruvolutionary performer who brought the art of Drag into the American public eye and made it mainstream. We are proud to add this groundbreaking entertainer on our historic Hollywood Walk of Fame,” stated Ana Martinez, Producer of the Walk of Fame ceremonies. Helping Master of Ceremonies Leron Gubler, President & CEO of the Hollywood Chamber of Commerce unveil the star was actress Jane Fonda. Named one of Time Magazine’s 100 Most Influential People of 2017, RuPaul Charles is a renaissance performer who has created an unprecedented career over 35 years as an actor, model, singer, songwriter, television personality and author and notably, the most successful drag queen of all time. RuPaul was born and raised in San Diego and later moved to Atlanta where he Studied theatre at the North Atlanta School of Performing Arts. In the mid-eighties, he settled in New York City where he became a popular fixture on the nightclub scene, earning himself the title: Queen of Manhattan. RuPaul's first prominent national exposure came in 1989 with a featuredrole dancing in the B52’s Love Shack music video. RuPaul achieved international fame with the release of the single, Supermodel (You Better Work), which was included on his debut album Supermodel of the World (1993). As an actor, RuPaul has appeared in more than 50 films and television shows both in and out of drag including Crooklyn (1994), The Brady Bunch Movie (1995), To Wong Foo, Thanks for Everything! Julie Newmar (1995), But I'm a Cheerleader (1999), Hurricane Bianca (2016), the Comedy Central series Broad City (2017), and the Netflix original series Girlboss (2017). In 1995, he became the first spokesperson for M.A.C Cosmetics, raising millions of dollars for the M.A.C AIDS Fund and becoming the first man to land a major cosmetics campaign. In 1996, RuPaul landed a TV talk show on VH1, The RuPaul Show and taped over 100 episodes with co-host, Michelle Visage while simultaneously co-hosting a morning drive radio show on WKTU, also with Michelle Visage. As a recording artist, RuPaul has co-written and co-produced 14 studio albums to date, including Foxy Lady (1996), Champion (2009), Glamazon (2011), Born Naked (2014), and American (2017). As an author, RuPaul has published two books: Lettin' It All Hang Out (1995) and Workin' It! RuPaul's Guide to Life, Liberty, and the Pursuit of Style (2010). Since 2009, RuPaul has produced and hosted the reality competition series RuPaul's Drag Race, for which he received the Critics’ Choice award and two Primetime Emmy awards for best host. The series, currently on VH1, has changed thefaceof primetime, providinga consistent spotlight for theLGBTQ communityforten seasons and launched thecareers ofover 100contestantswho havebecome global stars dueto thesuccess of the show. RuPaul's Drag Racehas inspired several spin-off series, including RuPaul's Drag U and RuPaul's Drag Race: All Stars. RuPaul is also featured as a host on the seriesSkin Wars: Fresh Paint, Good Work, and Gay for Play Game Show Starring RuPaul. RuPaul currently hosts the weekly podcast What’s the Tee? with Michelle Visage on iTunes as well as the bi-annual convention: RuPaul’s DragCon.